Who Says We Can’t Garden During Wintertime? Break the winter blands with a little greenery indoors. Learn about the most popular options for indoor gardening, and discover some special arts that combine creativity and gardening. Herbs thrive in a sunny window. Make sure they have well-drained soil and keep them clipped so they don’t go to seed. Dry them, freeze them or eat them fresh. Christmas is all packed away and your backyard’s a frozen wasteland. You yearn for some color, some dirt to play in, something to remind you that light and water and soil still add up to beauty and bounty. Maybe it’s time to apply that angst to an indoor gardening project. Whether you’re a novice or a green thumb, a cook who longs for fresh herbs or an adult wanting to share a fun project with a child, indoor gardening yields big returns for a small investment of time and money. Besides, plants filter your air and make your home a healthier place. Just ask NASA, which outfits its spacecrafts with houseplants to enhance air quality. 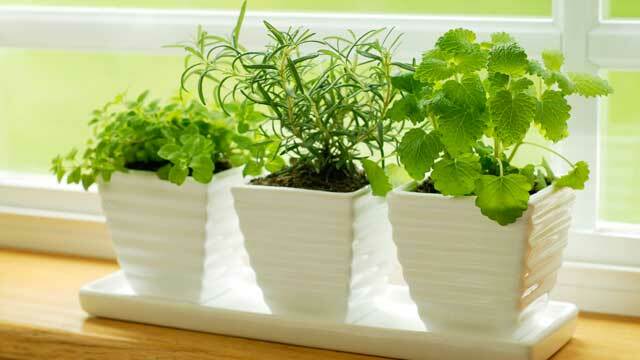 There are many approaches to indoor gardening. Maybe you’d like to create a whimsical fairy garden or terrarium, or hone your skills in a specialized category like bonsai, bamboo, orchid, topiary or herb growing. Perhaps you anticipate a room bursting with colorful spring bulb plants, like hyacinths and tulips, even as frost lingers on the windowpane. Or maybe you just want to grow a variety of healthy, happy blooming or non-blooming houseplants that add beauty and oxygen to your living space. Here are some thoughts on each of these fine options. Did you plant a terrarium when you were a child? The container may have been as simple as a large glass pickle jar or a covered fish bowl filled with pebbles, soil and a few plants. Terrariums are popular again, with some new twists. Elegant and whimsical containers are easy to obtain, ranging from a tabletop glass cloche or bell jar, to a stand-alone Wardian case – so named for the British doctor who discovered he could transport plants across the ocean inside of glass cases. Terrariums require little maintenance in exchange for the joy of watching a tiny, rainforest-like world evolve. A wide variety of plants may be used in terrariums and fairy gardens, and many new miniature varieties are being developed and sold just for this purpose. Among the many that Speaker recommends: Baby tears, small ferns, miniature African violets, creeping fig, dracaena, aluminum and lipstick plants, and herbs like wooly thyme and rosemary. 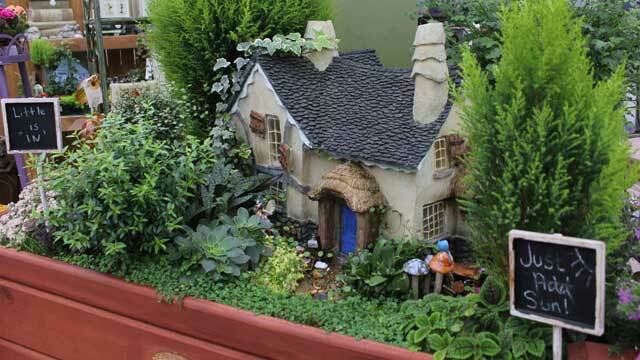 A Fairy Garden, at K&W Greenery, Janesville. K & W offers Make and Take sessions to help people get started on terrariums, fairy gardens and other planting projects. Those who become highly accomplished may eventually incorporate bonsai trees, carpets of moss, miniature blooming vines that cascade over trellises and arbors, water features, and even small live animals, like turtles or lizards. Remember: You don’t have to have a green thumb to grow a garden Tom Thumb would relish. Related to the realm of miniature gardening is the ancient oriental art of growing bonsai trees (pronounced bones-eye). Many people are surprised to learn that bonsai is not a tree species, but a method of growing and shaping a small plant or tree. Ogle County resident Bob Seele has been growing bonsai trees for the past 17 years. The hobby brings out his inner artist, while utilizing his green thumb and affinity for precision and spatial concepts. “I was a carpenter for 28 years and liked building something very pleasing to the eye, which requires precision,” says Seele. “You don’t build a cabinet to be mostly straight. You build it exactly straight. Likewise, a bonsai is always in the process of improving and becoming more and more pleasing to the eye. Newcomers to the hobby can read up on the bonsai tradition and learn from others who enjoy it. The Rock River Bonsai Society meets at the Rock Valley Greenhouse & Garden Center, 785 N. Bell School Road, Rockford, on the third Thursday of each month at 7 p.m. The Chicago Botanic Garden, Glencoe, Ill., hosts a permanent collection of bonsai contributed by the Midwest Bonsai Society. Growing orchids is another form of specialty plant growing. The beauty, complexity and variety within this hobby makes it appealing to many kinds of people. There are more than 30,000 species and 200,000 hybrids of this plant. Its ability to adapt to different climates and cross-fertilize with other species make the orchid unique and especially interesting; the plant carries with it a certain mystique and reputation for resilience. Many types of orchids are difficult to grow, which provides an endless landscape of increasing challenge levels for avid hobbyists, who are not unlike level-obsessed video gamers, in that respect. But, fear not. There are dozens of orchids that happily grow in your home, and these are the varieties most commonly stocked in local greenhouses. Start out with an orchid that’s already acclimated to the growing conditions you will be providing, by having a conversation with an experienced greenhouse professional. A more mature plant is less finicky than a young plant. The only way to be sure the bloom type will please you is to buy a plant already in bloom. Most orchids prefer plentiful light, and don’t like to be moved or repotted. According to the American Orchid Society (AOS.org), the phalaenopsis or moth orchid is among the easiest of orchids to grow, and appreciates the same conditions enjoyed by African violets. Another good choice is paphiopedilums, or slipper orchids, which have pretty foliage and will reflower in home conditions. Learn more about this rewarding hobby from local members of the Blackhawk Orchid Society, blackhawkorchid.com. Some other interesting specialty plants and plant art forms include bamboo, which can be grown in ornate, woven patterns, or indoor topiaries – plants or vines pruned or trained into certain shapes and forms. Imagine pots of colorful spring blooms inside your home as snowdrifts pile up outdoors. Better yet, imagine the anticipation of that scene. Envision pungent hyacinths, saffron or purple crocuses, rainbow-colored tulips, jubilant daffodils or one of their cousins, like paper-white narcissus. And, don’t forget the daffodil’s exotic South African cousin, the amaryllis, which is associated more with holiday months than springtime. “Especially in January, after the holidays, it’s fun to watch spring bulbs grow,” says Jim Behrens, owner of Behrens Blumen Stuff, Dixon. “Buy them potted, when the bulb is just starting to break the soil surface, and watch them grow over six weeks, then bloom. My favorite is hyacinth, because it smells so wonderful and can later be transplanted outdoors. Buy a pot of three to seven bulbs, take it home and keep the soil evenly moist. The same method may be used with tulips, crocuses, amaryllis and other members of the daffodil family. The majestic amaryllis grows fast and the blooms in shades of red, white and pink. The spectacular, large blossoms typically last for six to eight weeks. The list of houseplants we can grow is long and interesting, encompassing tropical, sub-tropical, temperate and succulent categories. Baeverstad is partial to the stalwart philodendron, a plant which seems to thrive on low light and erratic watering. Equally dependable is the pothos, often confused with philodendron. “They’re two completely different plants,” says Baeverstad. “The philodendron has a nice heart-shaped leaf that’s most often solid green. The pothos comes in many variegated varieties, like golden pothos, and its leaf is more elongated.” Either one is highly tolerant of human error. The peace lily also ranks high on the ‘favorite houseplant’ list, says Shirley Crawford, owner of Shirley’s Garden Arts, Winnebago, Ill. “A lot of people just like the name and the concept of peace,” says Crawford. “They’re a very easy-to-grow plant that can tolerate low-light conditions, but they bloom more often with more light – up to many times a year,” she says. Even when they’re not blooming, the strappy, glossy, deep green leaves of the plant are appealing. Succulent plants, like cactus, sedum, aloe vera and jade plant, need ample sunlight, but are otherwise easy to grow. They come in blooming varieties, including the much-loved Christmas cactus. Crawford is also leery of spraying plants with substances to shine their leaves. “I’m not convinced it’s good for them. Just shine up leaves with a damp cloth,” she advises. Another mistake people make is buying plants from inferior dealers. This entry was posted on Wednesday, December 21st, 2011 at 11:19 am	and is filed under Home & Garden, Top Posts. You can follow any responses to this entry through the RSS 2.0 feed. Both comments and pings are currently closed.